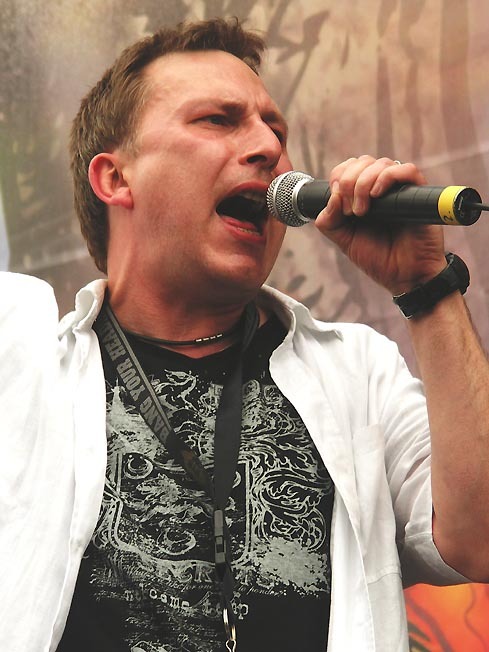 While in Germany for the Bang Your Head festival Mike Freeland (MF) took time to explain to Jon Hinchliffe (JH) how he came to be the new vocalist for Praying Mantis. JH – Can you run me through the bands you have played with prior to “Praying Mantis”? MF – Yes sure. At one point I was in a band called “More” and that curiously is a big part of why I am now in Praying Mantis. JH – Shall we start at the very beginning? Have you always wanted to sing? JH – Had you tried singing before then? MF – No and I was bad. I was absolutely awful. JH – So how did you realise you could actually sing? MF – The first band I joined, “Jewel”, had a drummer called Pete Bignall and at one point he turned round to me and said “The guys are progressing and you are not. The guys want to sack you. Get some singing lessons or they are going to sack you. You are an OK singer but you are not progressing” So I took his advice and went to a rather expensive opera teacher and I spent years learning with him. When I joined “More” I went back to him again. He asked me if I wanted to be a singer or to learn opera. I said I wanted to be a singer and he took me all through everything there was to learn to be a singer. He then turned around and said we have done all that we can do so why not give opera a go. And he eventually had me singing “Nessun Dorma” which was the big world cup theme. He would be behind the piano and I would do “Maria” from “Westside Story”. We also did “Music of the Night” from “Phantom of the Opera”, which I love as a song. This was a big one because it starts so low and it gradually builds you up until you are really hitting some top notes. That was my favourite song. “Maria” from “Westside Story” also starts down low and builds up and they are great songs to learn and to build your vocals up with. JH – What was the first band you joined? MF – My first band was a covers band called Freeloader. I was quite late starting really. I was originally planning on being a professional football (soccer) player. I was a damned good footballer until a bad tackle destroyed my knee forever and I stopped playing. I didn’t start singing until I was about 18 and that would have been in about 1981. Before then I was a devoted footballer. I played Saturday’s and I played Sundays. I guess you could say I am a person that wanted to become famous for something. I used to play defender and I was player of the season for several years and then because of my speed and my left foot they decided to put me on the left wing. It worked well and in the end what used to happen was the right winger used to attack and I started scoring goals and I was in line for being top goal scorer when I got my injury and that was that. So I moved on to singing. My older brother had loads of albums that are now considered classics but he bought them on release. In those days they were new albums by young bands like Led Zeppelin. He was like a kid buying stuff at the start of heavy rock and I had access to this huge collection of albums. So even when I was 13 and a devoted footballer I was listening to bands like Deep Purple, Led Zeppelin, Atomic Rooster. My dad wanted me to be a drummer and he was willing to buy me a kit but my brother took me to see the Moody Blues at the Hammersmith Odeon and I decided I would rather be a Justin Hayward. I still had no desire to be in a band but once the football was over that was my inspiration and believe it or not joining Jewel my first serious band links me to Praying Mantis now. But also it linked me to “More”. It is really weird. Why did what happened to me in 1981 snowball to what is happening to me now? At 18 my football was over and I had a big desire to be a singer in a rock band. I had been in a cover band called Freeloader for a while and then I replied to an advert for “Jewel” and in this band was Pete Bignall on drums. He was also a roadie for Bruce Bisland (later Praying Mantis’ drummer) in “Wildfire”. Also in “Wildfire” was Paul Mario Day on lead vocals. He was an awesome singer. We did a few gigs as “Jewel” and then we became a band called “Traitor”. I got to know Bruce Bisland and Bruce eventually played for “The Sweet” and “Praying Mantis”. I then went on to a band called “Axon IV” which was a very serious band and almost got signed. I did a lot of song writing with them. After “Axon IV” I was also in a kind of son of “Axon IV” called “Hassle Factor”. I then joined “Brian Connolly’s Sweet” for about a year. JH – Why did you join “Brian Connolly’s Sweet” when Brian was the lead singer? MF – Because at that point I could sing the ultimate high notes and I was a keyboard player. Pete Bignall who is the root man here said “I can get you in the band because Brian wants to sound like the old ‘Sweet’”. So when I joined I did really high harmonies and keyboards. I did that for less than a year though. JH – Why did that stop? MF - “Axon IV” had split up and I had brought in the “Axon IV” guitarist to play for “BC Sweet” and he didn’t like it. He felt it was like playing in a covers band even though I said “but it is the Sweet”. So anyway he left and Brian brought in another guitarist he knew from Birmingham. The guitarist then brought a bass player in and basically the line-up of “BC Sweet” totally disappeared. I left because I was the keyboard player and they decided they could make more money without a keyboard player. After that there was a whole bunch of us that had played in “The Sweet”. Pete Bignall had been in “the Sweet” too and he, I and the others decided to form a cover band called “The Sweetshop Boys”. This was because “Paddy Goes To Holyhead” and then the “Wondering Crutchless” had been doing so well. We then supported the “Crutchless” which featured Tino. This was around 1988/1989. Every Sunday we were down the Fulham King’s Head doing a double whammy of “The Sweetshop Boys” followed by the “Crutchless”. After that “Axon IV” reformed for a short while and then I joined “More”. I got a phone call from one guy saying that “More”, quite a famous band, were looking for a vocalist so give them a shout. I got the job and they gave me some old songs to learn from their back catalogue. On these I recognised a voice and it was Paul Mario Day the ex-singer of “Wildfire”. I said “Is that Paul Mario Day?” and Kenny Cox said “Yes he was my last vocalist was Paul Mario Day.” I was stunned so now I was replacing the singer I used to support. I did that for a short while. It got very, very close to a deal. EMI Germany wanted to sign “More” for an album and I had fans coming up and saying “you are by far the best singer ‘More’ has had” so I had the thumbs up from the fans but then Kenny Cox had multiple strokes. Kenny could no longer play guitar and there was no “More” without Kenny Cox. Going back in time a bit, at one point, I told Tino’s then girlfriend but future wife that I would like a few cracks at joining “Praying Mantis”. However back in the 80’s I wasn’t as good a singer. It was joining “More” that made me rehearse and rehearse. I went back to my singing teacher and I really pounded myself. So when Mantis kicked back in, in the 80’s, I wasn’t good enough to do it. When Kenny left “More” the bass player tried to continue it for a while but it didn’t work and then we formed a band called “Dangerous Breed”. Why it was called that I don’t know. I hate the name and I always have done. I had a friend who knew Chris Tsangarides the big producer of Thin Lizzy (He also produced Mantis’s “Forever In Time”). With him we recorded a Demo and then in January 2006 I went down to “The Cartoon” in Croydon and I saw “Paddy Goes To Holyhead” who I hadn’t seen in years. My friend Danny Burraway who has been in a few bands with me mentioned to Tino that I had been recording with Chris Tsangarides. Tino asked to have a listen saying “Mantis” had also recorded with Chris. So I sent Tino a CD and it is a lot more metal than “Praying Mantis”. He then gave me a call and he said “I don’t like what you write” which is cool “But do you fancy coming out to Germany and singing a gig for ‘Praying Mantis’”. I said “Yes of course”. So I did the gig and bearing in mind I wanted to join “Praying Mantis” back in the 1980’s, I was then nervous as to how I had been received by the band and the fans. We played fourth from last on the Saturday so we had a good slot and then on the Sunday Chris started talking about the next album. He enquired if I would be up for it. I said “Of course I would”. That therefore brings us to today. Chris has sent me some music, some of which he had written words for and a couple which he hadn’t. I demoed the lyrics Chris had and then Chris suggested I write something over the music which didn’t have lyrics. From that I have a couple of tracks one of which Chris is really pleased with. That is called “The Wolf Behind Your Eyes”. We had considered performing that track yesterday at the “Bang Your Head” Festival. But because Andy Burgess and I were both learning stuff it became too much for us to then learn a completely new song that had only just been written so it didn’t happen on this occasion. JH – What did you do in the 90’s then? MF – After “More” I played in a band called “Nemesis” and that has a link as well actually because Bernie Shaw who used to sing for “Praying Mantis” and is now with “Uriah Heep” has also done some stuff with Dave John Ross who was in “Nemesis”. So all through my singing life there have been links with “Praying Mantis”. JH – When we were chatting before you said there were 5 new “Praying Mantis” tracks written? MF – Yes they are “Touch The Rainbow”, “Witch Hunt”, “I Cried”, “Fallen Angel” and “Wolf Behind Your Eyes”. These are all demoed to different levels but they all have Chris playing keyboards and simulated bass and a drum machine. We have then layered vocals on top. Out of those it looks like “The Wolf Behind Your Eyes” is going to be a real killer. I wrote some verses and a chorus at the time we were rehearsing for yesterday's concert so it was bad timing really but Chris instantly picked up on the chorus. I wrote it in a way in which we can layer the vocals and there are tons of vocal harmonies available. My favourite is another track I have co-written called “Fallen Angel”. I am a “Goth” at heart and Chris’s music on this particular piece pleased me because it is so gothic and dark. “I cried” is a bit of a ballad but well scrummy. “Touch The Rainbow” I didn’t actually like at first because I was recording vocals of Chris’s synthesizer stuff. However we jammed it at rehearsals for last nights gig and it is now “Oh I get it. Yeah” and now I understand it I realise how good it is. “Touch The Rainbow” is actually a damned good song but I didn’t know because I sang it over keyboards. Again we considered playing this song here in Germany. JH – So have you written for other bands? MF – Yes all of them apart for the cover bands. In “Sweetshop Boys” we did Whitesnake covers and Sweet covers. But every serious band I have been in I have written for. With “More”, I wrote for “More”, I demoed for “More” and there was interest from EMI Germany. It was just unfortunate and sad about Kenny Cox. I can’t be angry about it. It was just one of those things. So I have written from the word go. JH – So do you write just lyrics and vocal lines or do you write whole songs? MF- I am used to guys giving me some sort of musical idea. It’s like Chris. Chris is a super writer. He will have pieces of music and it is like “I have got this idea and this is what it is. Can you think of a song to write over the top of it?” and this is how I have always written. All of the bands I have written for have come up with a riff or something and I have taken it away and written a chorus or something over it. Chris will write a piece of music and it is not a finished song it is just bits and pieces and he will say there is a verse here, a chorus here and bridge there and he will repeat it a few times and this will be what he presents as his idea. That’s how I like working. Someone gives me some ideas and I will sit down and start writing some melodies and a chorus. The weird thing about “The Wolf Behind Your Eyes” is for a part of that song Chris had an idea and I turned up to his place with my ideas and for that section I had come up with exactly the same idea. JH – And the five songs are currently purely Cubase demos with vocals over the top? There are no guitars on these songs at present? MF – That is right. Actually there are six songs because I have one of my old songs. It was a song called “Restless Heart”. I told Chris I had a song which had this melody and these lyrics but the rest of it had been written by other people. So I said to Chris Troy if we want to use it the backing has got to be written again and he was eager for the challenge. It was originally on the demo I did with Chris Tsangarides. All the new songs are demoed as you say except “Restless Heart” and that is because Chris is currently rearranging the music. The vocal line is all written so he is just writing the music under the melodies. They are damned good songs. “I cried” is really cool but I also like “Fallen Angel” and “Touch The Rainbow”. “Touch The Rainbow” being the song I didn’t quite get when I was recording because that was a song that Chris had written musically and vocally and where I just sang the lines as Chris and Tino told me. I didn’t get the full picture until we actually jammed it in the rehearsals for this gig. It goes a quite a pace. The drums are hacking away. All of a sudden it just fell into place and I realised how good the track was. JH – What is the biggest audience you have sung to before Mantis? MF – About 400 or 500. Last year at the Headbangers Ball here in Germany was the biggest gig I had played until yesterday. Yesterday was by far the biggest gig on the biggest stage I have ever played and I have to say I absolutely loved it. I absolutely went nuts. I was like a kid in a big playground. I feel 100 foot stages like yesterday are where “Praying Mantis” belong. They all rose to the occasion and the music is great. Andy who has only been in the band for 6 weeks was brilliant. He was so cool and played perfectly. The band line-up at the moment is fantastic. Everyone on that stage yesterday just shone and the music is built for a bigger stage. The current line-up is really good. Chris said he really hopes this line-up will last. Andy has a great guitar sound and it really complements Tino’s sound while being very distinctive. Benjy is a fabulous drummer and so for me even if I wasn’t in the band and I saw the line-up it is a cracking band. There are no famous faces so it is not a circus with ex-members of this band or that. It is the Troy brothers. It is their band and they have got a band that is purely a line up of guys that want to do the songs. Andy has ties with famous people and we have all done a bit but there are no “ex-people”. It is Tino and Chris and they are Praying Mantis and they have got a bunch of guys that have done the rounds and now they are working hard writing for a new album. It is a band with a lot of enthusiasm and we now have to finish writing some songs and see what happens with the fans.